Trotux is a browser hijacker that come bundled with another free software that you have downloaded. During installation, it changes Google Chrome’s settings such as a home page and default search engine. In addition, this hijacker may change the properties of Chrome shortcuts on the desktop and in the Start menu by adding argument http://trotux.com/. So, every time, when you will run your Google Chrome, it will open a Trotux web site. Don’t panic! Trotux will not, generally speaking, do you any harm. You probably will want to get rid of it as quickly as possible, because this browser hijacker is a very annoying! Every time you start your Google Chrome you will see Trotux web page. Of course you can setup your home page again, but next time you start your browser you will see that annoying web site return. As mentioned above, the Chrome’s hijacker changed the default search engine on the unwanted web-site too, so all your search queries will be redirected too. Thus the authors of the browser hijacker may collect the search terms of your queries, and redirect you to malicious websites. Technically, Trotux hijacker is not a virus, but the virus behaves similarly. As a rootkit hides in the system, changes Chrome’s settings, and blocks them from changing. 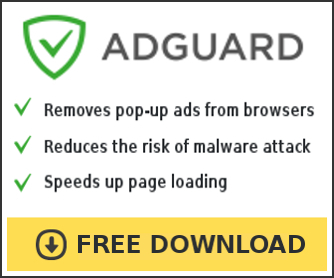 Also this hijacker can install additional Google Chrome’s addons, extensions and modules that will display advertising banners and popups. Probably this browser hijacker get installed onto your PC when you have installed a free software like E-Mail checker, PDF creator, video codec, etc. Because, most commonly Trotux is bundled within the installation packages from Softonic, Cnet, Soft32, Brothersoft or other similar web sites. So, read term of use and user agreement very carefully before installing any software or otherwise you can end up with another malicious software like Trotux hijacker on your PC. 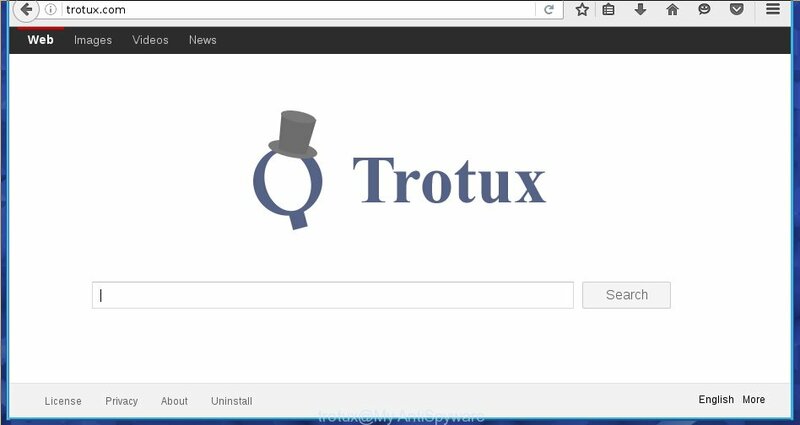 Trotux hijacks your Google Chrome homepage, default search engine and shortcut. Internet Searches are redirected to Trotux. 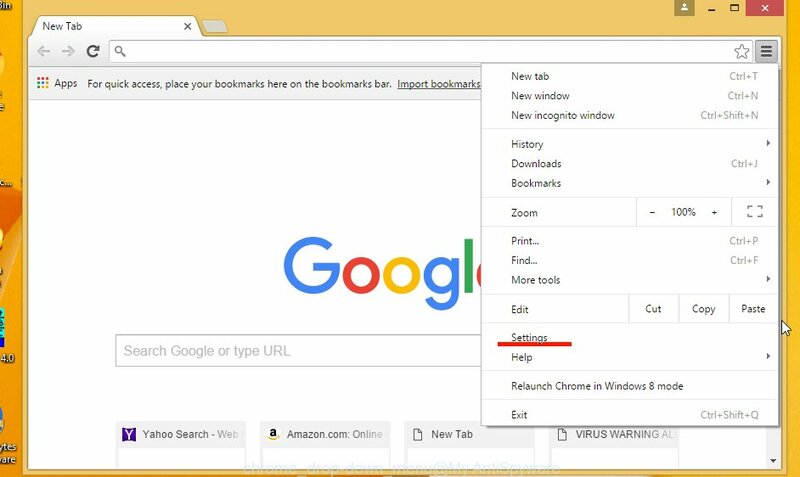 The following instructions is a full step-by-step guide, which will help you to remove Trotux hijacker from Google Chrome. Moreover, the steps below will help you to uninstall potentially unwanted software such as adware and toolbars that your computer may be infected. Please do the instructions step by step. If you need a help or have any questions, then ask for our assistance here or type a comment below. 1. 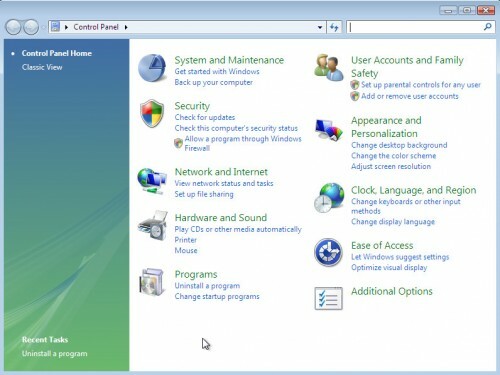 Uninstall Trotux associated adware by using Windows Control Panel. 2. 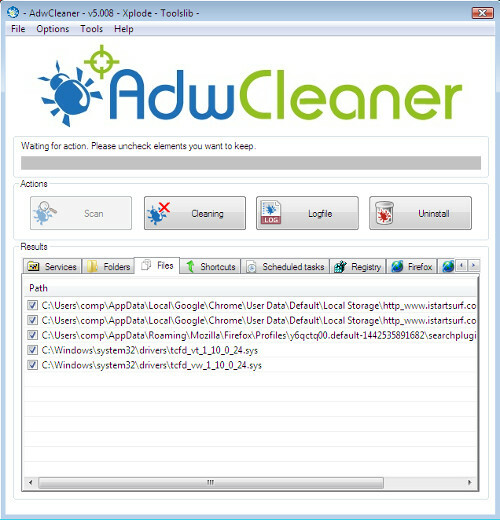 Remove Trotux hijacker and malicious extensions from Google Chrome with AdwCleaner. 3. 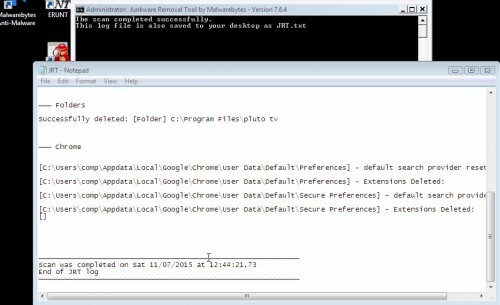 Remove Trotux from Google Chrome with JRT (Junkware Removal Tool). 4. Remove Trotux from Chrome with MalwareBytes Anti-malware. 5. 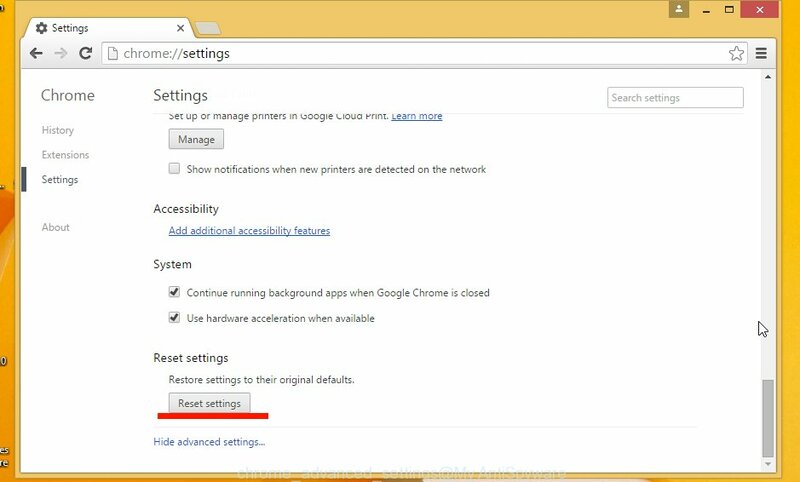 Reset Chrome settings to remove Trotux browser hijacker (Optional). 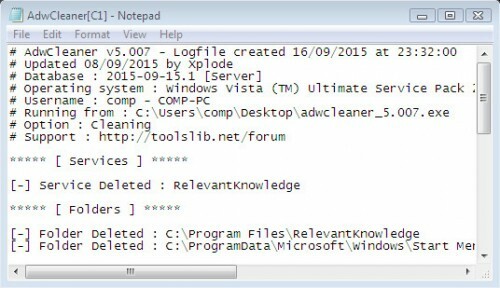 AdwCleaner is a free software that scans for and removes adware, toolbars, potentially unwanted programs (PUP) and browser hijackers like Trotux. 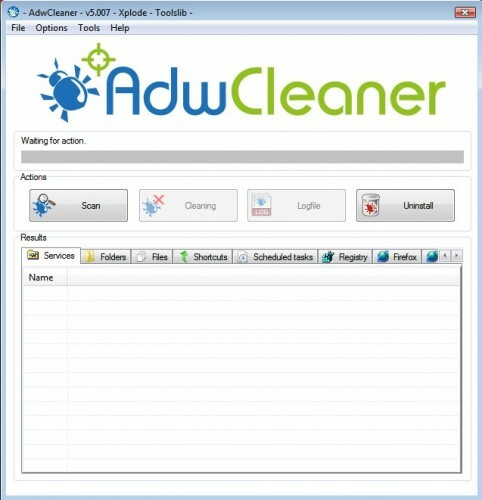 AdwCleaner makes it quick and absolutely free! This utility does not conflict with any antivirus, so that it can be safely used. Press Start button to perform a system scan for Trotux browser hijacker. Once AdwCleaner has finished, it will open a scan report as shown below. During the scan, Junkware Removal Tool will check startups, services, processes, files, folders, registry keys, registry values, Google Chrome’s settings and extensions and remove Trotux related malicious software that has been found. 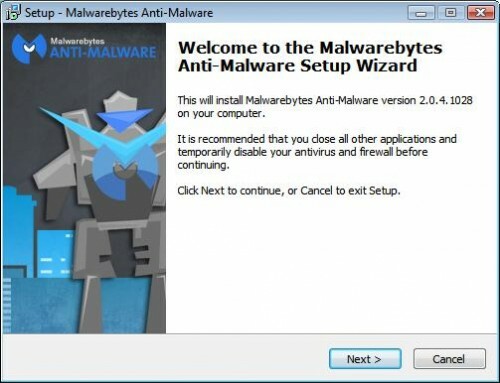 Malwarebytes Anti-malware detects and removes malicious software such as adware, toolbars, potentially unwanted programs (PUP) and browser hijackers like Trotux that even the most well-known antivirus and antimalware programs cannot. This program does not conflict with any antivirus, so that it can be safely used. Now click on the Scan Now button to start scanning your computer for malware that cause a redirect to Trotux. This procedure can take some time, so please be patient. When the scan is finished, make sure all entries have “checkmark” and click Remove Selected button. 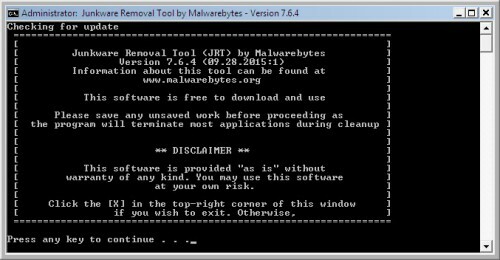 MalwareBytes Anti-malware will start to remove Trotux hijacker related files, folders, registry keys. Once disinfection is completed, you may be prompted to Restart. Confirm your action, click on the Reset button. After that, your Google Chrome’s settings will be reset to the original and redirect to Trotux will be deleted. After completing these instructions, redirect to Trotux in Google Chrome will be completely removed. Your home page and default search engine has been restored. Unfortunately, the authors of such malicious software are constantly updating them, making it difficult to cure the computer. Therefore, if this guide will not help, then you have caught a new version of Trotux hijacker and then the best option – ask for help here.